Jonathan Burdick, dean of admissions and financial aid, greets African Leadership Academy students and their support families. The University of Rochester ranks as the number one destination for graduates of the African Leadership Academy (ALA), a selective college preparatory program in South Africa. Last week the University hosted the academy’s 4th annual indaba, meaning “gathering” in Zulu – the largest conference in North America for students who have graduated from ALA and are pursuing higher education in the United States. Sixty-eight students attended the event. Founded in 2008, the academy identifies high school students who have demonstrated leadership potential and sets them on the path to become African leaders and entrepreneurs through a rigorous two-year pre-university program. Many of the graduates attend college in the United States, and about 10 percent of all the U.S. bound graduates have enrolled at Rochester—more than at any other university in the world. 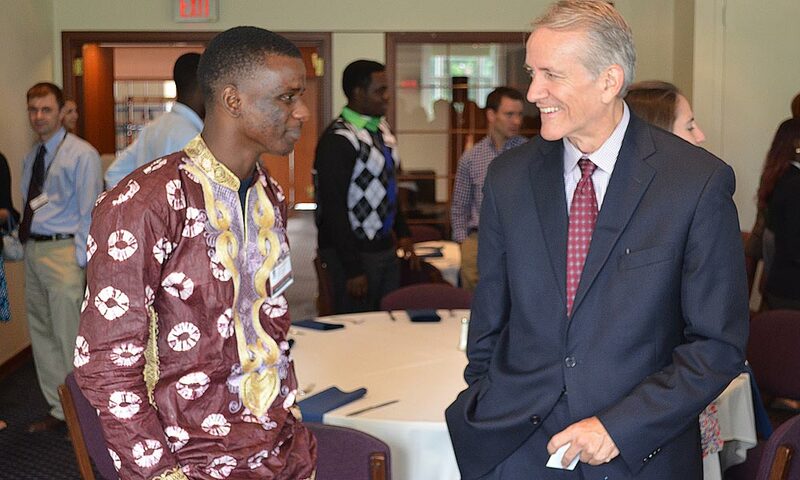 “We have become the number one destination for African Leadership Academy graduates because we’ve not only been committed to having so many of their students, but those students also have done very well,” says Jonathan Burdick, dean of admissions and financial aid at the University. The first cohort of six students graduated this past spring, four of them with engineering degrees. One student will continue on to complete a master’s degree at the University and five have returned to their home countries. Two of those students started businesses while studying at the University, including a sustainable agriculture project in Northern Uganda and a micro-lending business in Tanzania. Another student has employment in public health, and two graduates have earned positions with multinational firms. Burdick notes that having African youth graduate with a solid education and return to their home countries makes a significant impact on African society. In total, the University has enrolled students from 32 different African countries, including those students who have entered the University through other scholarship programs.